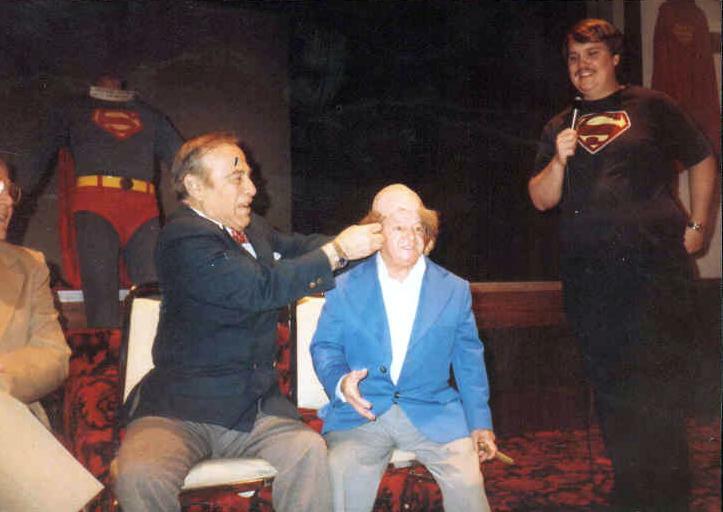 Harry Thomas comments on Superman and the Molemen: The film makers wanted to use children to play the mole men. After reading the script I told them that we don't want children for this picture. Their skin isn't porous enough for the make up, they can't act and worst of all their stage mothers are always disrupting things. I suggested using little people instead and producers agreed. They offered suggestions, but left the execution of the make up to me. The producer had wanted the mole men to look frightening and hideous. But how was Superman supposed to feel sympathy towards something monsterous looking? I made them pathetic and I'm glad I did. Your heart really goes out to these gentle little people. They lived underground, so I kept their makeup on the pale side. I made their bald heads appear larger than their faces. Since I couldn't find bald caps small enough to fit their tiny heads, I had to make them. I stuffed the bald caps with cotton to fill them out. George Reeves was fun to work with. One time I walked into his dressing room and he was singing. I told him that "I can sing too," so we sang a little song together. I remember one time I was putting on his make up and he said "ouch". So I asked him, "Superman, did I hurt you?" During the first season of the television series, I received a few letters from angry parents who complained that their kids were trying to fly out of windows and were falling on their faces. The kids were trying to imitate Superman! 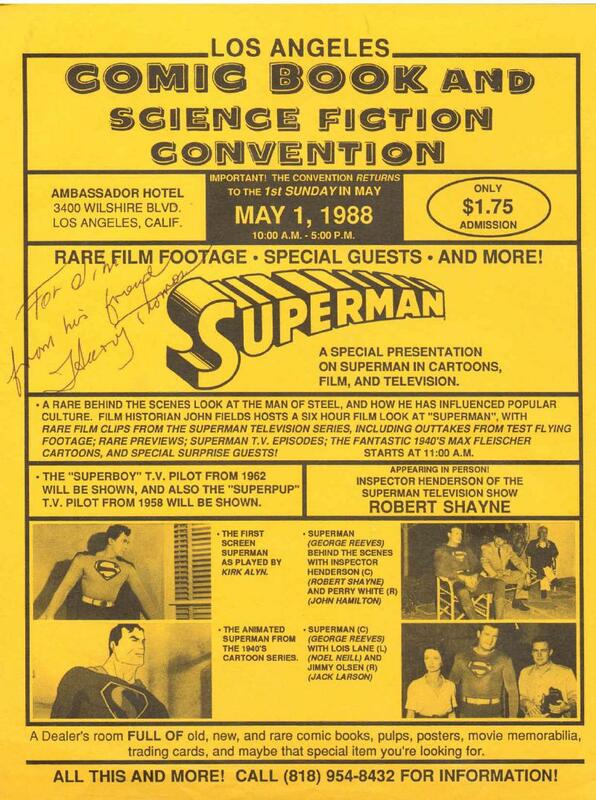 Well, I had nothing to do with making Superman fly, but the parents saw my name in the credits as make up artist and said, "Aha, he's the one. He put the costume on Superman and made his face up." The parents were really very hostile. I didn't want to ignore the letters so I wrote them little notes back and said "I'd like to fly, myself. Why don't you watch your kids?" KG: I'm speaking with Harry Thomas, make up artist of the 1950's, famous for such movies as Ed Wood's Glen or Glenda and Night of the Ghouls and other favorites like The Neanderthal Man, The Unearthly, and Killers From Space. But what we're really interested in is your work on The Adventures of Superman. 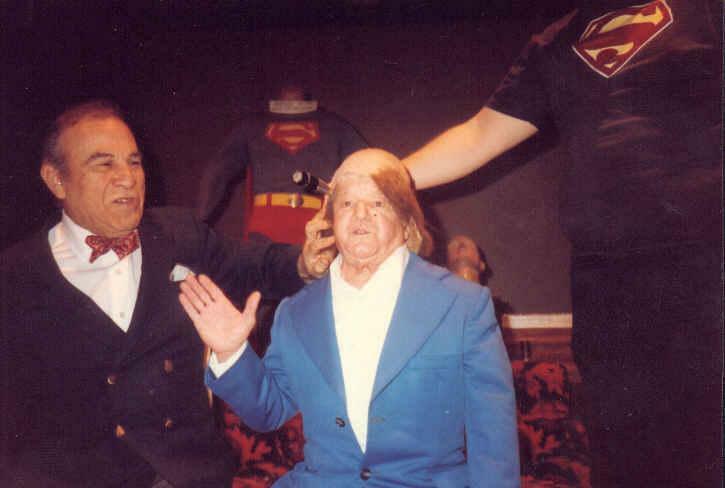 You were the make-up artist on Superman and the Mole Men and the early episodes of the television series. Could you tell us a little about what you were doing at the time and how you got involved in the movie? HT: Well, I was always impressed with the comics, the strips. Superman was always one of my favorites when I was younger, and they wanted someone who knew something about prosthetics. We made the first feature, Superman and the Mole Men, and I was very excited. Originally, they wanted children to play them (the mole men), but I thought that their skin wasn't porous enough (for the make up), so we debated over it and ended up getting three or four little people for the parts. Billy Curtis was one, and a few others. It was exciting because the picture was so unusual. They came out of the bowels of the earth and I thought that was fascinating. It excited me because of the originality and the imagination of it was so overwhelming. 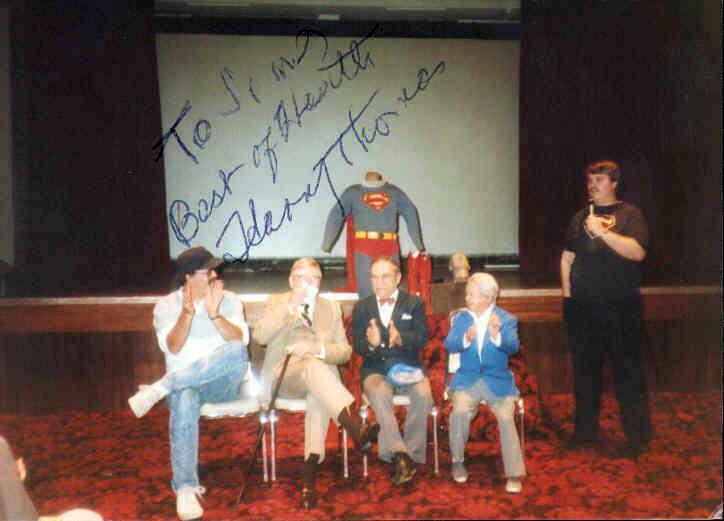 George Reeves was so nice, a very pleasant person. He had a guitar, and we used to sing together in his dressing room. One time, though, I was a little rough on his make-up early on and he exploded a little bit. He had had some surgery. I think he was a fighter when he was a kid. After that I always used a tender, light, sable brush on his nose. Phyllis Coates was such a wonderful little girl to work with too. KG: So you did make up for the entire cast? HT: Oh, I did everything. You know, when you work on these budget pictures you have to do it all. And they expect you to do it fast and good and say nothing and walk away. But I did enjoy it. Of course, the money's nice, but you want to do good work and feel satisfaction when you see it. KG: So you had a genuine interest in the Superman character and in making a fun picture? HT: Oh, absolutely. At times the suit wouldn't fit George too well and I'd carry these wooden clothespins. When everything was set up I'd be in back of him, and before they would shoot I'd take the clothespins and fasten them to the back of his suit and it gave him a good fit. KG: Reeves wore some foam padding under the outfit to make him look bigger and more muscular. Were you involved in creating that? HT: Well, I personally didn't like the idea of it being visible like that. He had a pretty good physique, but they exaggerated it too much and it was obvious. So I had something to say about lessening it some. KG: Yes, it did improve after the original feature, and it was less obvious where the padding ended. 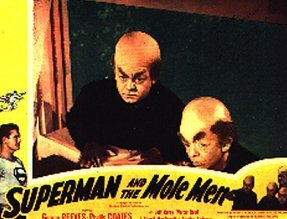 When you created the make up for the mole men, did they have designs in mind that you had to follow or did you come up with the concept of what the mole men should look like? HT: Well, at first they wanted them ferocious, mean and dangerous looking. But I figured if they were going to be a friend of Superman, he was supposed to save them and be sympathetic toward them, they should look sympathetic. They should look mild-mannered and not be frightening. I tried to get that in the make up. I drooped their eyes down and made them look soulful, so that the sympathetic feeling that he had for them had a reason. KG: Well, it was very effective. For the time and the budget that you had, it came off very well. The tall, bald head gave it a strangeness, and yet they were very child-like and almost cuddly. I know I, along with every other kid that grew up watching the show, felt extremely sorry for them. HT: That's right. That's what I wanted. You see I wanted the audience to be sympathetic too. I wanted them to seem pathetic. "This is not our world. Let's go back to it." And they never did any harm to anybody, so if they were vicious and mean and ferocious looking it wouldn't have worked. I always tried to make the make up add to the story and help it make sense or add to the character. I used to add a little shading to the sides of George Reeves' nose to make his nose look thinner, and I tried to bring out his jaw as much as I could to give him the look of Superman. KG: Reeves' hair was prematurely gray. Did you ever color his hair when you were working on the series? HT: Oh sure. His hair was gray prematurely. It was hereditary on his mother's side. He would dye it every two weeks. We would always touch it up every day on the set. I used food coloring. Of course, it was a big secret. We weren't supposed to let anyone know. 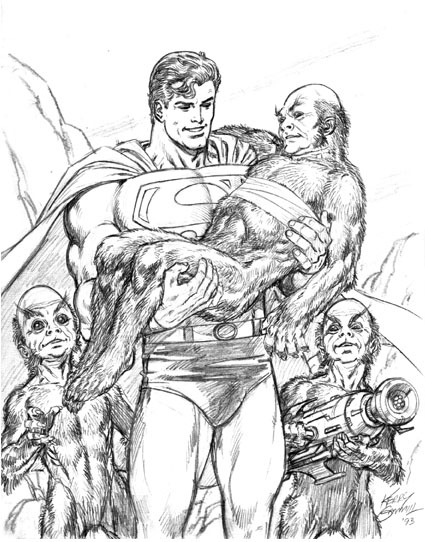 After Superman and the Mole Men, when we did "Superman On Earth" where they send him off in a rocket, I aged his earth parents twenty years. I added gray to their hair. KG: Had you ever met George Reeves before working on Superman? HT: I had seen him. I was one of the make up artists on one of his other pictures. He did other things, but this was the main thing in George's life. There was nobody who looked more like Superman than he did, facially, and he had a good body, too, but I think that the wardrobe was just a little too overdone with the padding. KG: Did you get to know him well and become friends? HT: Oh, yeah. He had a certain privacy that he wanted, and he was rather selective. I met him once up in the canyon just before he died and he said, "Gee, hold it there. We're going to have something soon. I'm going to direct, and I want you with me." That was the last time I saw George. We parted friends. KG: Speaking of his death, do you have any opinions about his supposed suicide? HT: I can't believe it, really that he would take his own life because George liked people, and he liked himself, and he had everything to live for. His mother was still alive at the time, and he had his girlfriend. George was very jovial. He had a little bedroom over his garage for friends. He had parties, of course. I don't believe that he was the type who would take his own life. 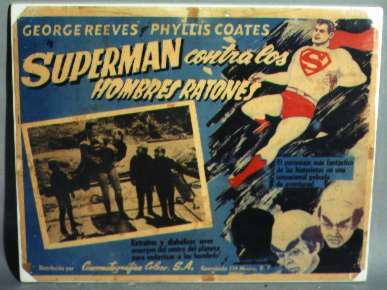 KG: You also worked with Robert Shayne, not only on The Adventures of Superman, but also on The Neanderthal Man in which he starred. What are your memories about that film and working with him? HT: The only thing I remember about Bob Shayne is that he had a very good delivery and voice. He had an excellent mind for remembering passages from the script and had a good handsome face and could take most any part and do it well. Shayne was a trooper. He was a man who was born for the theater, and I have all the respect in the world for him. I understand that he left us about a year ago. KG: That's right. But he was still working occasionally even though his eyesight was almost completely gone. HT: Well, the nice thing about it is that he lived to be a ripe old age. I think he was ninety, wasn't he? That's not bad. Well, Bob was a very good friend, and I always admired him. In The Neanderthal Man, when he was giving a lecture to the other scientists....well, it was about four and a half pages long and he never missed a word. He went on and on and on and got it all in one take. KG: Was it actually him wearing the make up or was it a stunt man at that point? HT: Well, sometimes it was a stunt man and sometimes it wasn't. The work was real rough. Sometimes we needed a stunt man, but in the changes that you saw before your eyes, it was Bob wearing the make up. KG: Would you rather have used a full make up instead of a mask if you had more time or were you satisfied with the way it came out? HT: I liked the way it came out. You've got to remember, time is the main element when you're working on a budget film, and money, too, isn't that plentiful. So what I did was I shortened the time by having a mask that could be worn by the double too. I believe it saved time and money, and I think Bob himself enjoyed it more that way. But he was very cooperative. He was always willing to work with you. And he was the type of a man that you would like as a neighbor and to get to know better. You know....good company. KG: How long did your association with the Superman series last? Did you do any beyond the first season? HT: Well, I did maybe two of them beyond that, but I had another series to do, and I couldn't go back with them, but I enjoyed it. KG: Thank you, Mr. Thomas. It was great meeting you. HT: You are very welcome.